their Picture Communication Symbols (PCS) as part of Microsoft Learning Tools. 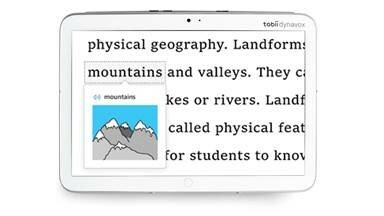 A student will now have the ability to click on a word, see a PCS image, and hear the word read aloud simultaneously to aid with reading and comprehension. This feature is built directly into the Immersive Reader feature within Word Online, OneNote Online, OneNote for Windows 10, OneNote iPad, Outlook on the Web, and Outlook.com. For over 20 years, PCS have been the most widely adapted symbol set used by millions of students and adults around the world to communicate, learn, and experience. Follow the conversation online and share the news by following the Tobii Dynavox Facebook page! Snap+ Core First Gets Even Better! Hey Tek-Ninjas! It's been a minute. I've been deeply immersed in the Tobii Dynavox world. Learning every day and seeing users that simply blow me away. If you have followed my blog for long, you understand that I've spent my career working with young people. In my new position as an AAC Consultant, I have had the distinct honor of working with many amazing adults who are seeking their voices. I have met people whose proficiency with our eye-gaze system has left me feeling amazed and delighted. The future is bright I tell you. But today's blog article is a bit about our AAC software, Snap+ Core First. In my opinion one of the most robust pieces of AAC software ever, and phenomenally easy to manage for caregivers and therapists alike. That ease in my mind is the difference between a device sitting on the shelf unused, or a device being customized for the given user and opening a new world. If you own the software, or even have the free (voiceless) version, be sure to run your updates from the App or Windows store. About a month ago, for no additional cost, we pushed out the English/Spanish version. No cost I say. And yesterday we pushed out the English/German version. Because the German iteration requires a different symbol set there is an in-app cost of $54.99. Accessing these different languages is as simple as logging out of your user, and creating a new profile. Be sure to use the pull down menu to see the different language options. If you are unfamiliar with the software you can download the voiceless version for free which make a great tool to familiarize yourself, and as an Editor version to work on client's pages without taking their devices from them. Windows 10 version is here. For your ipad, go here.